House located in a quiet residential complex with swimming pool, community gardens and children's playground, only 100 m from the beach. 15 minutes by car from the urban center. It is distributed over two floors: On the ground floor is the kitchen (ceramic hob, oven, microwave, dishwasher), 1 toilet and a living room (TV, fireplace) with access to the garden. On the upper floor there are 3 bedrooms (1 with double bed of 150x190cm, one with 2 single beds of 90x190cm and a suite with bath and 2 beds of 90x190cm and exit to the balcony, 1 bathroom (with shower) .The house has a garage ( 5 x 2.9m) (washing machine) Supermarket and restaurant nearby. House located in a quiet residential complex with swimming pool, community gardens and children's playground, just 100 m from the beach. 15 minutes by car from the urban center. It is distributed over two floors: On the ground floor is the kitchen (ceramic hob, oven, microwave, dishwasher), 1 toilet and a living room (TV, fireplace) with exit to the terrace. On the upper floor there are 3 bedrooms (1 suite with bathtub, double bed of 150x190cm and balcony and 2 with 2 single beds of 90x190cm in each of them, 1 additional bathroom with shower and washing machine.The house has a garage (5 x 2,9m). Supermarket and restaurant nearby. Animals not allowed. Wonderful restored house from the 17th Century located in the village of Cruïlles, 8 km from the centre and 25 km from the beach. Very well decorated and furnished house, with a capacity for 11/12 people (600 m2 + 3000 m2 for plot). It has all the necessary requirements for a perfect holiday. It has 4 double bedrooms (3 double beds + 2 single beds) + 1 tripple bedroom + 1 extra bed, a living-room (fireplace, -TV-sat, hi-fi, dvd), a bar, an equipped kitchen (microwave, washing machine...), 2 bathrooms. Also has a cellar and a gym. Garage (1 car) and parking (4/5 cars). 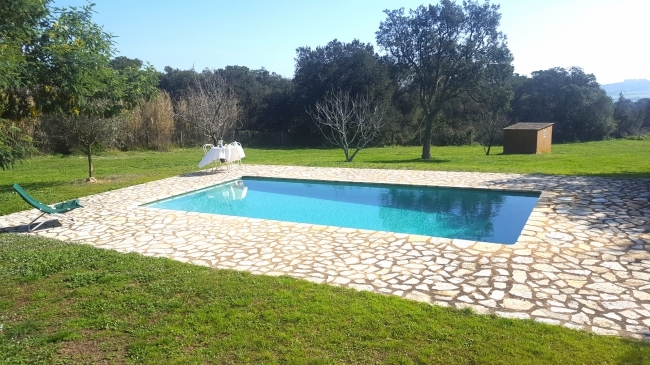 Very complete outside area, with private pool (8 x4 m), garden (solarium and shadow areas, with deck chairs...), 2 barbecues, terraces with view to the mountain. Outside Spa shower and all kind of entertainment for all the family. Masia in a rustic style of 315 m2 with swimming pool (8*4m) and private garden, located in the town of Mont-ràs, 5800 mts from the beach and 1500 mts from the center (850 meters there is a supermarket). The house is distributed over 2 floors. On the main floor, it has a living room, 1 bathroom (1 with shower), 1 living room, fully equipped kitchen (dishwasher, washing machine, microwave), and porch. On the upper floor there is a chill out lounge with fireplace and Tv, 1 bathroom (with bathtub), and 5 bedrooms (2 with a double bed, 1 with 3 single beds and 2 single rooms). It has a direct communication with the municipalities of the coast, the beaches of Calella de Palafrugell, Tamariu, and easy access to the motorway to connect with Girona and Barcelona. It is an ideal house for lovers of nature, the outdoors and privacy. Rural tourism. 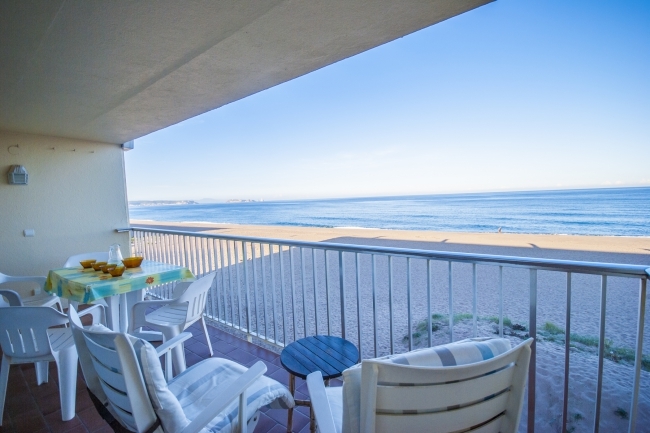 Basic apartment located in Pals, on the seafront and 100 m from the center of the city. Second floor without elevator. It has 2 double bedrooms (1 with double bed of 140x190cm and the other with 2 beds of 90x190cm), a living-dining room (TV and fireplace) with access to a terrace with stunning views of the sea, a simple kitchen (gas stove, oven, microwave, washing machine), a bathroom with shower + 1 toilet. Parking area. Animals are not permitted.